The purpose of this animated business finance training video is to enable managers to appreciate how key financial statements are calculated and how they are used. The light-hearted approach of this world-famous program helps take the fear out of financial documents and complex concepts and, although accounts might never become a manager’s favourite topic, it does at least make them understandable. You’ll meet two contrasting people – a well-educated company director, and the streetwise owner of a small factory – to see how the whole process of business finance works. Because the success or failure of her manufacturing company is down to her, the factory owner knows the importance of understanding how money goes round the business and how to track and measure it – and she’s happy to explain it in everyday language! 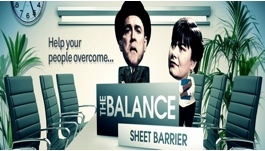 Featuring John Cleese and Dawn French, this training video will enable managers to appreciate how key financial statements are calculated and used.